The Ross Farm Museum represents rural life 150 years ago and at that time animals played a very important part in all families. The farm animals had to provide many things in order for the farmer and his/her family to maintain a living. They provided food, transportation, clothes and a source of income, just to name a few. 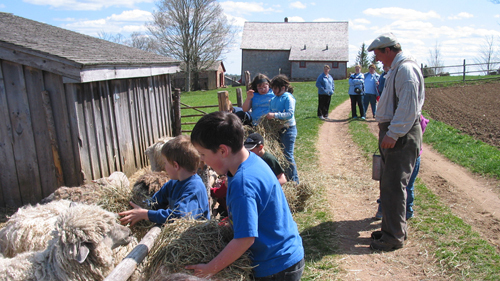 Offered in this hands-on, students have the chance to learn about animal health, what foods they eat and how they were so important to the early settlers. Unlike the farms today with only one or two types of animals, these early farms had many kinds of animals in order to carve a living out of the forest. These animals included; chickens, ducks, geese, horses, oxen, cows, sheep, pigs, and of course, cats. There is always a variety of ages for each kind of animal, as well. Little lambs play in the fields, chicks scratch for grain in the summer sun and foals run to see just how fast they can go. Everyday of the year, the farmers here at Ross Farm have to feed and care for their animals. On many of these days there are plenty of helpers to lend a hand. Hands-on groups have the opportunity to feed and clean out the stables of many of these animals, while learning the importance of each one and why this breed is here at Ross Farm. At Ross Farm we have a Heritage Animal Program, keeping animals that fit our time period while helping to maintain these rare breeds. Other facts you will learn include; what is the difference between and ox and a cow, how does the farmer separate the cream from the milk and of course, you will have a chance to milk the family cow. The farm cats may not be the largest animal on the farm, but they do have to perform an important task. The farm cats receive most of the attention as children play with them throughout the whole area.